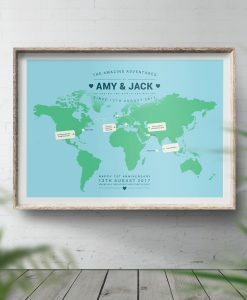 Our best selling products; Personalised Travel Maps. Designed by No Ordinary Emporium. Display the places that you have been around the world on one of our custom illustrated world travel maps. 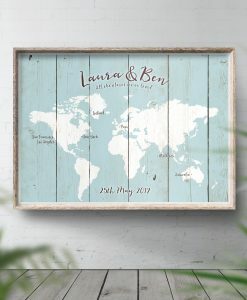 They are personalised with the names or message of your choice and make perfect 1st Wedding Anniversary gifts, popular as 30th and 40th birthday presents to family or friends, or to celebrate recent travels. Our designs can be changed to suit your colour scheme. Please get in touch with us if you would like us to create something more personal to you.